Hunan Gongchuang Photovoltaic Science&Technology Co.,Ltd (for short Gongchuang PV)founded in 2009,is located in the National High-tech Development Zone,Hengyang comprehensive Free Zone,is a pioneer enterprise of silicon-based thin-film solar module which engages in thetechnology developement,photovoltaic products manufacturing,the application of on-grid and off-grid solar power plant and building integrated photovoltaic (BIPV).In 2012,Ningxia branch company founded in Wuzhong,Ningxia province. 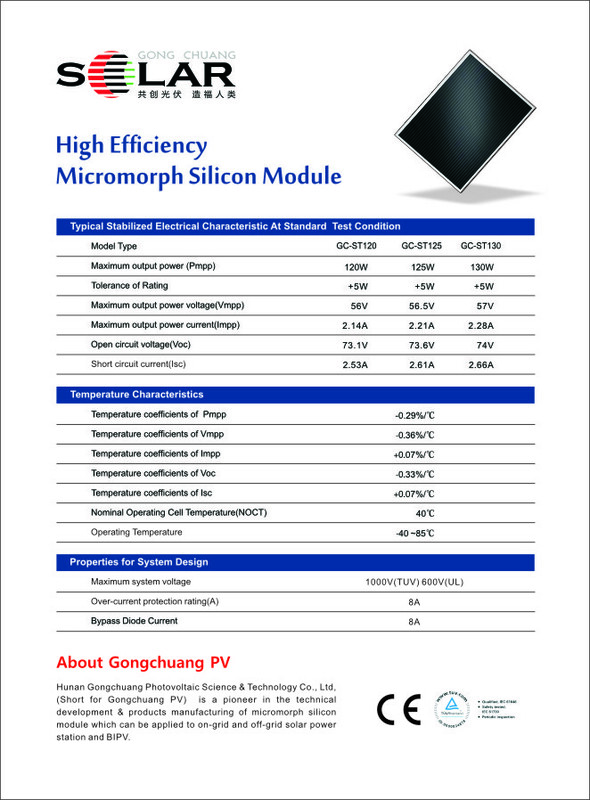 We imported the most advanced producing line and technology of silicon-based thin film module in the world,with independent intellectual property national invention patents of 6,more than 20 other patents.We can produce the thin film module with conversion efficiency of 10%-20% which have reached the highest international industry standards.The initial capacity is 50MW,ecpected capacity in 2015 will reach 500MW. Our products are exported to Russia,Germany,France and other places,also have achieved products(system)sales agreement of more than 380MW with domestic and foreign customers including the Unitd States,Poland,Netherlands,central Africa and South America,the total installed capacity reahed 22.65MW in 2013. 2015.06.12 - Super sale season is coming!